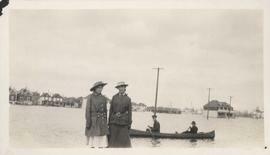 Photograph shows scene from the 1916 flooding of the Assiniboine River in Norwood, two unidentified women standing on flooded residential street in foreground with two unidentified men paddling in canoe behind them. Postcard is a photographic print. Photograph taken by Advance Photo Company, Winnipeg. Azo mark appears in stamp box, made in Canada. Postcard shows men on wooden sidewalks. Postcard is a photographic print showing water flooding homes. Photograph taken by Advance Photo Company, Winnipeg. Azo mark appears in stamp box, made in Canada. Postcard is a photographic print showing water flooding homes likely in St. Boniface. Unknown photographer, Noko mark appears in stamp box. Photograph shows scene from the 1916 flooding of the Assiniboine River in Norwood, homes under water on residential street in view. Postcard is a photographic print showing water flooding homes and other structures. Photograph taken by Advance Photo Company, Winnipeg. Azo mark appears in stamp box, made in Canada.